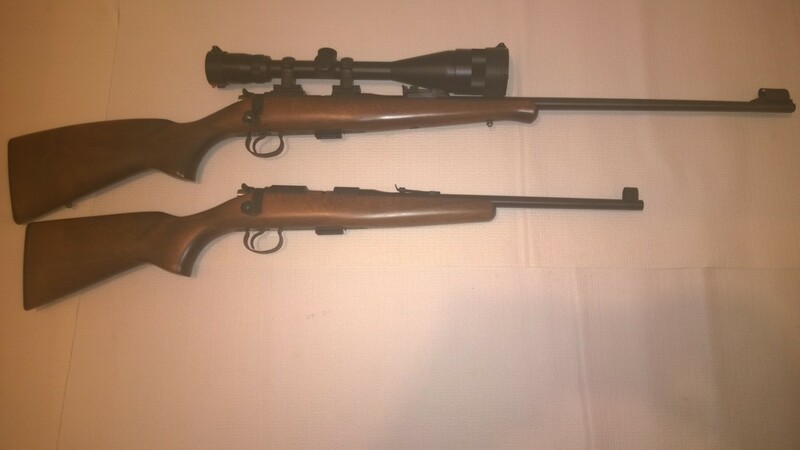 I've been watching 452 Scout rifle in my distributors inventories for quite some time, but, given its relatively high price, could never persuade myself to buy it: the street price for the Scout was almost $100 more than a comparable youth rifle from Savage. However, now that CZ has deprecated almost all of the 452 model in favor of the new 455 - which I like a lot less - I have been on a mission to buy all 452 rifles that I could, whenever I see them, and so when one of my distributors got a few in stock, I grabbed a couple. Apparently, I was not alone on the mission to buy them up - the three guns that remained there after my order were all gone that same day. The rifle arrived in the same box as its bigger brothers, even though it had occupied barely two thirds of it. Just like its bigger brothers, it came with the factory target showing a slightly over an inch 5-shot group at 50 yards. Not bad for a youth gun! Out of the box, it did not look like a kiddie rifle, not the way for instance Savage Rascal does. It looked smaller, yes, but more carbine-smaller, not kid rifle-smaller. This is probably because it retained the thickness of the stock, and the receiver was the same - thick and sturdy. Most other kid guns shave material all over - CZ 452 Scout is simply shorter, but not any less built. Here it is next to the CZ 452 Military Trainer. The stock is shorter by just a bit - it does not feel uncomfortable for an adult. It also has the same thickness to it as the Trainer. The 12" length of pull is 1.5" shorter than either the Military Trainer or Savage MKII FV family, but the diminutive Savage stock looks and feels more "youth" than the Scout's. The receiver is the same as the rest of CZ 452 line, with the very same thick walls machined from a steel block. The rifle comes with a single-shot adapter, but will work with any standard 452/455 magazine. One place where CZ did cut corners is the sights. Unlike the thick, hight quality, milled sights of CZ 452 Military Trainer, these are simple stamped things, just like most other modern 22s, and only elevation adjustable. (Please note - this part of the article was written about 6 months later, and the rifle that was shot is not the one pictured above). 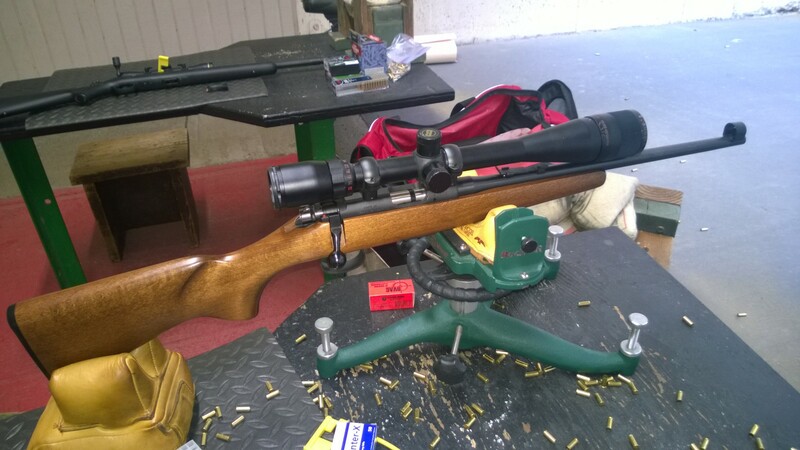 The ultimate test, of course, is how a rifle performs on the shooting range. The day was somewhat windy, so I stayed on a 50 yard line, even though I typically test my 22s on a 100 yards range. 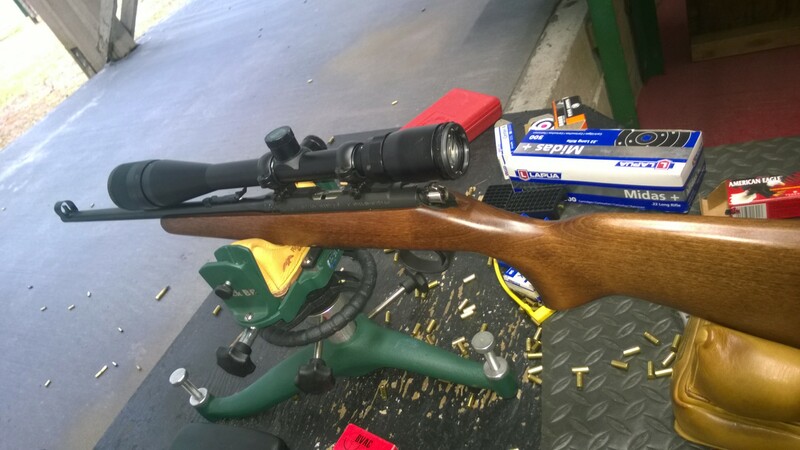 For the purposes of testing I have mounted a Bushnell Banner 6-24x44 scope using medium Burris Signature 22 rings. This made the 44mm objective just clear the barrel, but the scope covers could not be put on. For a medium framed shooter such as myself, the rifle was not uncomfortable to either hold, or shoot from the rest. I started by dumping a couple of boxes of cheap ammunition through the barrel, simply to lap the barrel somewhat. Of course just two boxes are nowhere near enough - most 22lr rifles come into their prime after a few bricks - but I had a few boxes of Aguila ammunition which is so incredibly inaccurate in any rifle or a handgun that I tried, that I simply find no other use for it. For real target testing I first tried it with CCI Standard Target - this cheap yet high quality ammunition is my default choice for almost all pistol shooting, and it performs reasonably well in most rifles. ...but not in CZ 452 Scout, however. The results were bad. Like REALLY BAD. 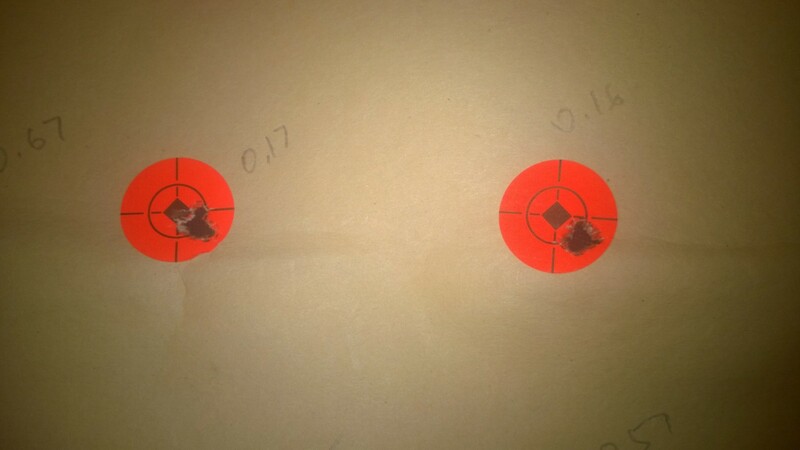 2-3" groups at 50 yards. I didn't even bother to keep the targets. The groups for American Eagle copper plated 38gr hollow points were 0.83, 1.09, 1.01, 0.55, 1.5, so the average was 1.0", or 2MOA. 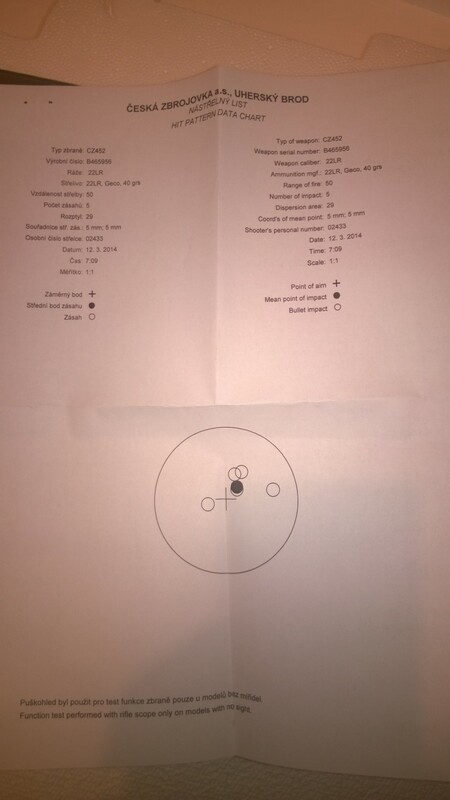 The groups for American Eagle 40gr were 1.8, 0.99, 0.75, 0.63, 1.24 with the average of 1.1", or 2.2MOA. Groups and averages for Wolf MT: 0.78, 0.35, 0.54, 0.63, 0.72, average 0.6, or 1.2MOA. Not bad for a "kiddie" gun :-)! I still have a ton of SK Rifle Match ammunition. This is supposed to be Wolf Match Extra equivalent, but it did not perform in any of my rifles particularly well. The street price for this ammunition is around $8/box. 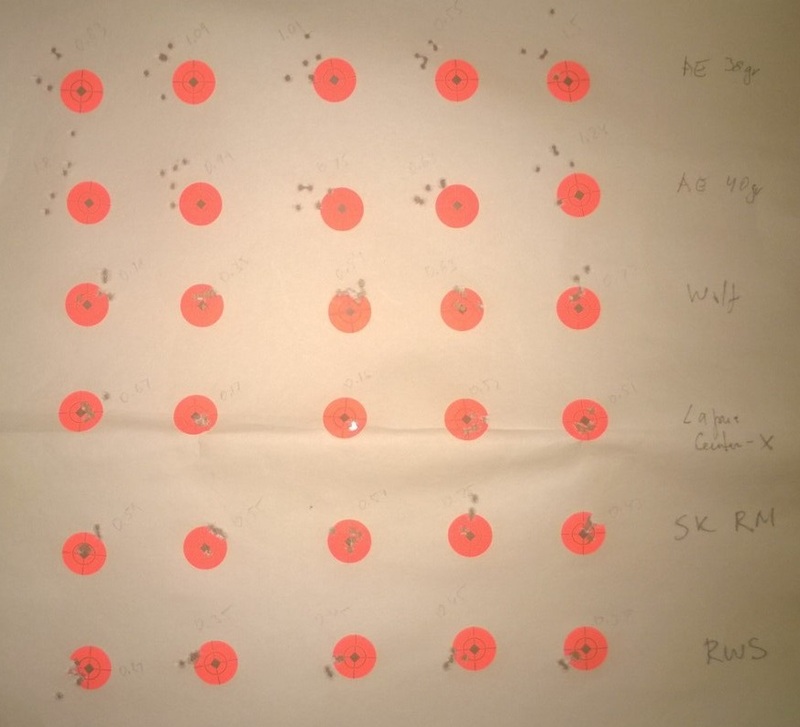 Groups: 0.59, 0.55, 0.57, 0.75, 0.43, average 0.58" - just under 1.2MOA. RWS Target Rifle is in the same price category as SK. I had a couple of boxes of it, so I tried it on the Scout. Groups: 0.87, 0.35, 0.45, 0.45, 0.37, average: 0.5. We are in 1MOA territory now! Exciting! Finally, Lapua. I have been a Lapua ammunition distributor for a couple of years, so I have a bunch of it in my private reserves. Center-X is the cheapest Lapua brand, and can be typically had for about $12. It performs quite well in many of my rifles. It performed SUPERBLY in the Scout. ...and here is the whole target. In conclusion, CZ 452 Scout is an interesting specialization of the legendary family that should interest not just the kids. In particular, any serious CZ collector should have one, and if you are in the market for a compact 22 rifle, it is a high quality, accurate, and relatively inexpensive variant. 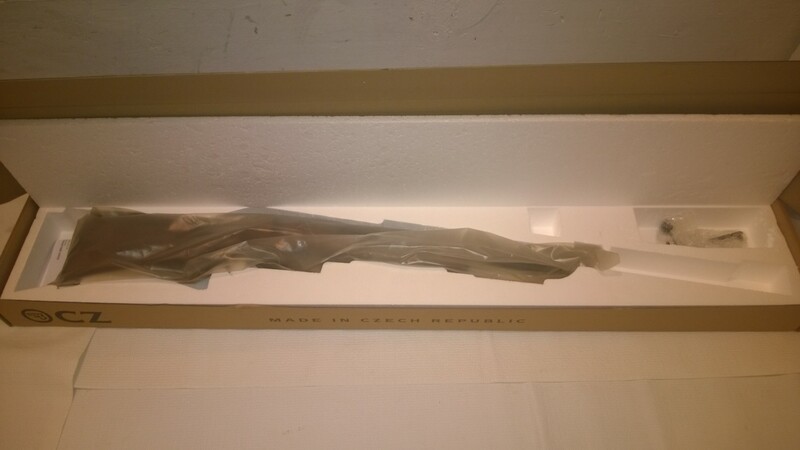 As of this writing (7/25/2014) this rifle is still available from CZ, and we have several in stock.